Located at the crossroads of Europe, Middle East, and Central Asia, Turkey has a vibrant startup ecosystem attracts many entrepreneurs in the region as well. Despite political and economic uncertainties both in the country and in the region, the Turkish real estate/internet industry presents many opportunities to local and international investors over the coming terms. The real estate sector accounted for approximately 8.4 per cent of GDP in the last decade. On the investment side, FDI inflows -in real estate and construction- stood at USD 4.6 billion in 2017. Back in January 2018, I have founded “EurAsia PropTech Initiative” out of Istanbul to create an ecosystem flourish in Turkey and in the region. There is so much potential. I just need to light the fire. 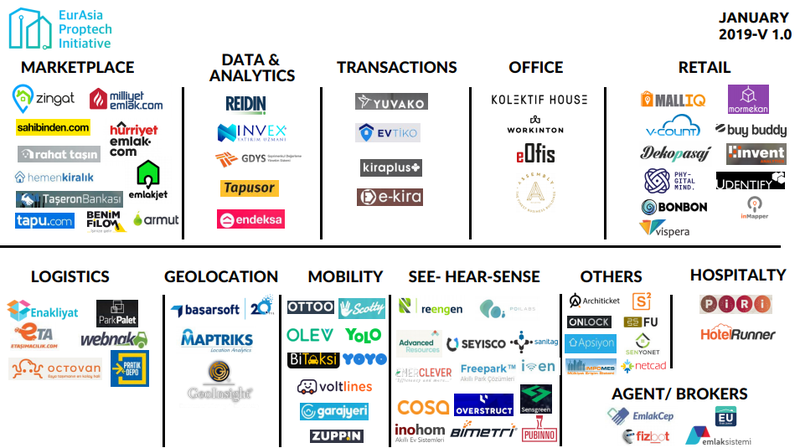 As EurAsia Proptech Initiative, we are happy to launch the first version of Turkey’s PropTech Map that includes 81 companies. Under “Others”, we have added companies focusing ConstructTech, property management, mortgage and smart lock. Since this is the first version of the map, Expect some changes in categories as well as companies in the coming versions. Soon, we shall also release the PropTech Maps of the countries in the region. As always, your participation and contribution are highly appreciated. This article was also published in Futureproptech.co.uk blog pages.